The main thing in putting together a mic cabinet is to not forget the main thing. What is the main thing? It's that no one ever went down the street humming the sound of a microphone. The main thing is the music. In the grand scheme of things, mics capture the performance of the music. I get upset sometimes when I read the recommendations made in magazines or on the internet about what microphones one might need for a project studio. It's almost as if most writers want to overwhelm you with the sheer number of microphone recommendations they can make per column inch. They seemingly possess a gear fantasy and want to pass the addiction on to you rather than helping you create music. I take a different tact. Music comes first. I believe it's better to be the master of a few microphones rather than not knowing much at all about a whole lot of mics. In the last few years I've come to the belief that most project studio enthusiasts can get by with three or four mics if chosen wisely. I also think if you want to build a bigger mic collection that these three or four core microphones can be the basis of a quality microphone collection that will serve you for many years. And, if you can only afford one microphone, then I believe my choice as the number one priority will cover those readers who only want one mic. I think the number one priority in recording music is a versatile mic. There are two reasons for picking a versatile mic for the one spot. First, it's going to be your first mic. You may not have the budget to stock your mic cabinet all at once. It may be the only mic you'll have for months or even a year or so. The second reason is that you might have someone in the studio who is putting out some great guitar licks or some interesting vocal phrasing. And, if you start fishing around for the very best mic to capture the performance, then you risk losing the moment. So, it's good to have a versatile mic you can put up to get the performance to tape. A versatile mic rarely turns out to be the very best mic for any recording job. But, it usually turns out to be the second or third best mic. It's a mic that can do a fairly decent job at a lot of things. I suggest a cardioid pattern large diaphragm condenser microphone for the one spot. Remember: It's got to be versatile. For the two spot I recommend a pair of small condenser microphones. For the three spot I recommend a low frequency microphone. For those on a reasonable budget, I recommend the AT4040 for the one spot. It streets for about $299. It's a true large diaphragm condenser mic. It possesses a good fit and finish. And, it shines on a lot of sources. For example, on acoustic guitar, the AT4040 puts across a musical and detailed sound. It doesn't get harsh in putting across an acoustic guitar's high frequencies (even some expensive mics famous for this application can't avoid this one). A lot of pros use a pair of the AT4040 exclusively as drum overheads. If you want some sizzle in your drums, then the AT4040 can be an excellent choice for overhead duties. The AT4040 doesn't possess the tightest cardioid pattern. So, you'll capture a bit more sense of the space with them than the typical cardioid condenser. But, the mic also possesses good rear rejection. The AT4040 also functions well on a variety of voices, both male and female. It's on the brighter side of neutral without getting brittle (as many lower cost large condensers do). The mic's frequency response does contain some added dBs at 6-8 kHz. There's also a bump just above 10 kHz. Even so, I've not experienced any problems with the mic getting essy or bringing out plosives. The AT4040 sort of lies in between sonic quality bright vocal mics and the higher quality dynamics. I believe the second priority in putting together a microphone collection is a pair of instrument condensers. The market changes so much that it's difficult to make a firm recommendation for a budget conscious microphone. I recommend Russian made Oktava MK012 small diaphragm condenser microphones. Why a pair of instrument condensers in the two slot? I think that recording is about capturing an image or sense of space. An AT4040 is a versatile mic. You could make a nice multitrack recording with only that mic. However, if you were to add some small or medium condensers to the mix, then you create different pictures of sound to put across in your recording. In essence, it helps make things interesting. Oktava mics have been sold in the USA for years by the Sound Room. They are not an official reseller (and never have been). They buy Oktava mics in Russia and quality control the mics before importing them into the USA. Be warned that the Sound Room wants about $250 per mic for single capsule models and about $350 per mic for multicapsule models. Most project studio enthusiasts will want to stick with the cardioid caps. But, other capsules can be helpful. An attractive alternative is the Avenson STO-2 pair of omni electret condenser microphones, which street for around $545. The third priority to my mind is a low frequency mic. I like the Audio-Technica ATM25. Unfortunately, my friends at Audio-Technica discontinued it in favor of the ATM250. Is it better? Let me put it this way... Try to find a used ATM25. If you can find one for under $130, then buy it. Either seems to work with most any source on bass amps or kick drum. Either mic also can double as a dialog mic. I think if one starts with a mic collection that includes an AT4040, a pair of MK012s and an ATM25 then he should be able to cover most any task that should arise in a project studio. For those with more resources I recommend starting with an Audio-Technica AT4047 rather than the AT4040. I like the AT4047 for its aggressive FET sound yet I find that it works on a lot of sources. I believe after getting these first mics that you're well on your way to putting together a collection of quality mics. Depending on your needs you might want to focus on adding some more microphones. You might look at a quality dynamic mic such as the Shure SM7B. 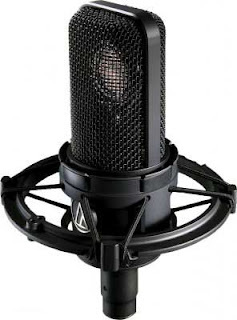 You might condenser a quality condenser microphone such as the Microtech Gefell UMT 70S. Anymore, I recommend trying to put at least one ribbon mic in the collection. Ribbon mics by Royer and AEA certainly get my recommendation. Sometimes, ribbons bring out the sonic richness of an instrument unlike any other type of mic. I remember being in a studio once and hearing a tenor saxophone tracked with an AEA R84. I've been around some of the best sax players on the planet at times due to my jazz background but I've never heard a better tone put to tape than with the R84. The Royer R-121 tends to be the favorite guitar amp mic. I also like the AEA R92 for guitar amps. The AEA R92 currently is my favorite microphone. You might also consider the Soundfield SPS422B Microphone System. It can record mono, stereo and surround from a single microphone and 1U control unit. Nothing else on the planet can put across a sense of space as this microphone system can. Some people like to get deep into dynamic mics after putting together an essential mic collection. Try some old mics from Electro Voice, Beyer and Shure. Just look around here at Mojo Pie for entries about these mics. I know people get tired of hearing it but in dealing with pro audio products you'll find if you don't buy quality then you'll buy twice. Higher quality does not necessarily mean a higher price. If you find a mic at Mojo Pie that gets a highly recomended or very highly recommended then you can probably be assured that it's good at any price. If you've read this and you're in despair as you can't even manage the budget for an AT4040 let alone the other mics that go with it then don't worry. Some inexpensive mics that come to mind that get my personal recommendation or the recommendation of my friends include the Audio-Technica AT2020 and the CAD M-179. Don't forget the Shure SM57 but I freely admit to not owning one. I am not one to tell you that a $150 mic can match the sonics of a $2,000 mic. It's not going to happen. However, you could make a decent recording with a CAD M179.